Prototype: Inter-City express train cab control car for push/pull trains. Swiss Federal Railways (SBB) type Mark IV Bt. 2nd class with engineer's cab similar to that for the class Re 460 locomotive. Model: The car has maintenance-free LEDs for headlights and the marker light. The engineer's cab has interior details. There is a coupler at the car end without an engineer's cab. The car is ready for installation of 7319 current-conducting couplings or 72020/72021 current-conducting couplers. The car has adjustable buffers. Length over the buffers 27.5 cm / 10-13/16". 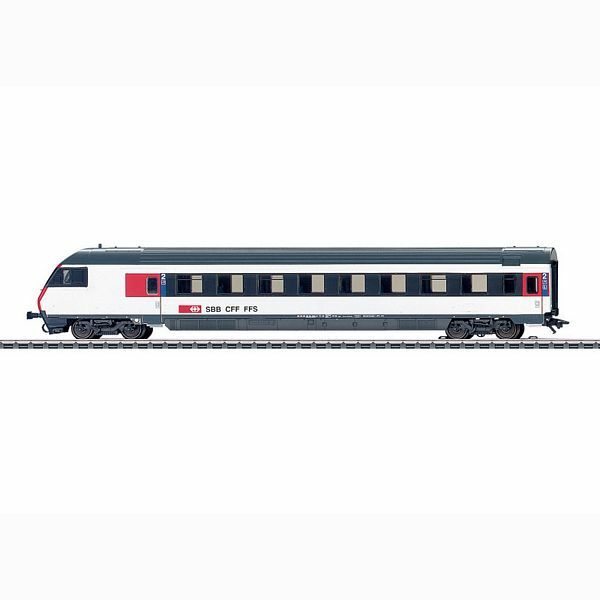 The Inter-City cab control car can be added to the express train in the 29463 digital starter set or to the 42152 and 42160 express train car sets.